Third-party logistics (3PL) providers and their customers have yet another huge wave of industry innovation and growth to ride. The first wave in the modern era of 3PLs in the US began in the 1980s with trucking deregulation, business process outsourcing, and the beginnings of what is now known as supply chain management. Today, successful 3PLs are adapting their business models, capabilities, and services to catch another wave now gaining momentum, arguably the most powerful yet and energized by technology innovations. In this Brief, we reflect on the history of the 3PL industry in the US and outline our view on the innovations likely to power 3PLs forward and to enhance the value they create for customers worldwide. Throughout, we cite examples and suggest actions 3PLs might take to help their companies and customers catch and stay on top of 3PL 3.0. The term Third-Party Logistics first came into usage in the 1970s in reference to the emergence of intermodal marketing companies which served as third parties linking shippers and rail carriers. 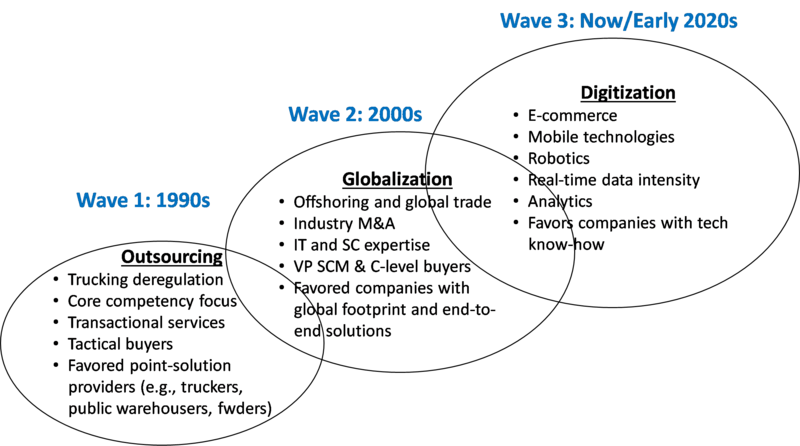 With this start, the first 3PL innovation wave (Figure 1) gained momentum starting in the 1980s and accelerated with the business opportunities presented by interstate trucking deregulation (enacted in 1980), the impact of Michael Porter’s rethinking of the basis of competitive advantage, and the adoption of a focus on core competencies, outsource non-core business functions message espoused by influential management gurus such as Peter Drucker and others in the 1990s. At the same time, the discipline referred to as physical distribution grew in size, scope and sophistication. In 1985 the premier professional organization in the field was renamed the Council of Logistics Management (CLM); it became the Council of Supply Chain Management Professionals (CSCMP) in 2005. Third-party logistics providers such as Exel (now DHL) grew rapidly, both organically and through acquisition, leveraging innovations in logistics and riding the overall business process outsourcing wave. 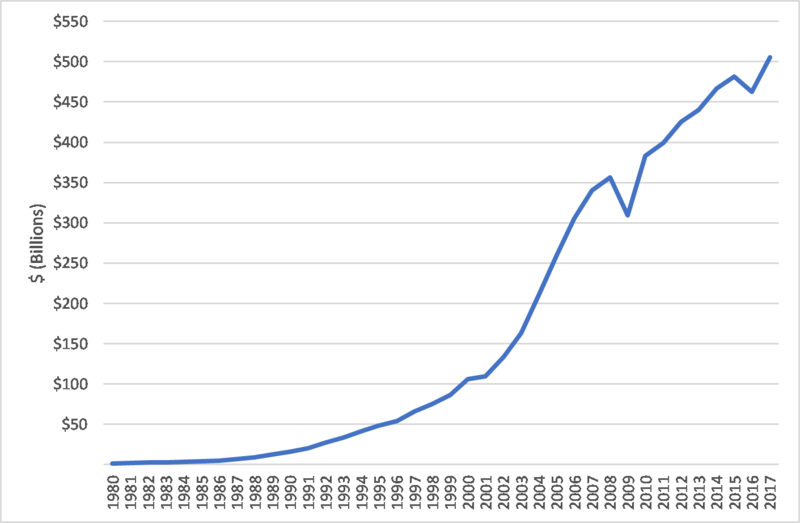 The globalization of the supply chain and offshoring of US manufacturing to Asia (especially to China) ramped up in the 1990s and accelerated into the 2000s after China joined the World Trade Organization (WTO) in 2001 (Figure 2). 3PLs responded by offering enhanced solutions addressing new shipper challenges as suppliers and manufacturing moved to Asia: enhanced international end-to-end multimodal transportation solutions, integrated customs compliance and trade consulting services, purchase order management, and IT tools and control towers for global network optimization and visibility. With the acceleration of e-commerce, powerful new IT technologies, and data – lots of data (e.g., IoT), shippers face new opportunities and challenges. 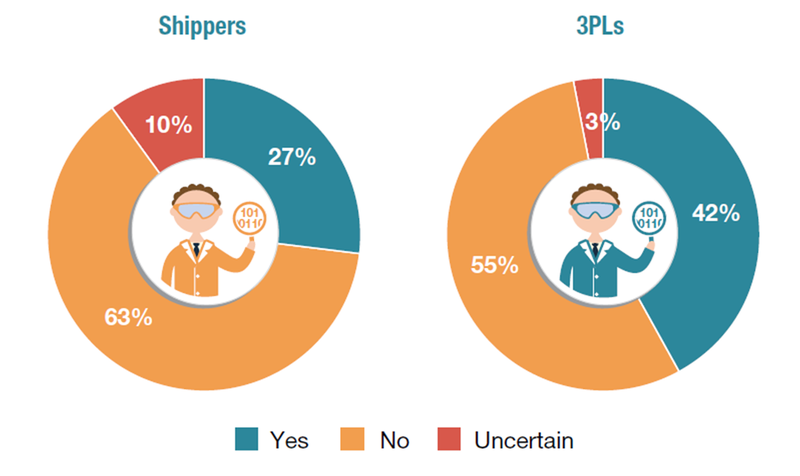 Today 3PLs are once again well positioned to help shippers make sense of all the options and provide solutions that satisfy the increasingly challenging needs for more responsive and cost-effective supply chains. And for sure, 3PLs’ stakeholder demands for profitability, growth, and sustainability will only intensify. In this next section, we posit that the third wave of 3PL innovation and growth will be powered by new and enhanced customer solutions incorporating technology advancements in five areas: robotics, large-scale networked services, autonomous trucking, blockchain, and adaptive intelligence. Traditionally, earlier generations of warehouse robotics and other forms of conventional automation technologies have been underutilized by 3PLs. With typical customer contracts ranging from two to five years, payback on such custom-built and configured automation often failed to meet 3PLs’ ROI hurdles, particularly when the opportunity to repurpose/reuse the equipment for other customers was limited. As a result, conventional automation still has its highest adoption in warehouses operated by the shippers themselves or in large-scale 3PL operations where customers sign long-term service agreements or take on the asset ownership themselves or financially backstop a 3PL’s investment. Moreover, in the post-Great Recession years, plentiful warehouse labor and stagnant wages made conventional automation a harder sell for shippers and 3PLs alike. The situation has now changed. This next generation of autonomous mobile robotics is finally hitting the sweet spot for 3PLs. They are more intelligent, flexible, cheaper, and can be more easily incorporated into existing warehouse operations and work cooperatively with associates on the floor – “cobots.” This means they can be deployed more quickly and generate higher ROI. Then when customer requirements change (and they often do for 3PLs!) or contracts terminate, the robotics can be redeployed from one account to another or from one campus to another, much like a forklift. Large 3PLs like DHL and XPO, as well as smaller providers such as Barrett Distribution and RK Logistics, have seen significant improvements in productivity and substantially reduced payback periods deploying mobile robots to work alongside warehouse associates. Even drones are being deployed in warehouses – Geodis, the global 3PL, reported success earlier this year with the technology to facilitate physical inventory audits and improve accuracy. Going forward, we expect tightening labor markets and rising wages to drive higher ROIs and faster adoption, particularly as piece-picking robotics becomes more cost effective. 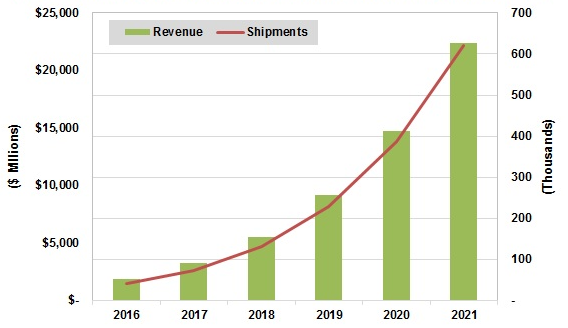 Globally, the research firm Tractica forecasts the worldwide warehousing and logistics robotics industry to reach $22.4B by the end of 2021 (Figure 3). 3PLs have always been adept at configuring solutions, particularly asset-light providers, utilizing the services of 2PLs or other suppliers of specialized logistics services: land, sea and air transport carriers, warehouse providers, equipment suppliers, software companies, and even labor providers. In the early days, these providers enabled 3PLs to expand beyond point solutions, such as a public warehouse, to provide an integrated warehousing and transportation solution as shippers sought to outsource more functions. Then in the era of globalization, 3PLs linked together international end-to-end solutions spanning factory pick-up, international transport, and customs brokerage through to customer end-country distribution. 4PLs have also emerged, whose primary mission is to configure and manage a network of 3PLs, 2PLs and others. With today’s IT technology (including blockchains and adaptive intelligence, discussed later) to connect, optimize, and manage an even bigger network of suppliers, 3PLs can now create customer solutions that may incorporate thousands of underlying providers and still deliver a seamless customer experience. In this way, even small 3PLs can offer broad capabilities to shippers. These networked logistics suppliers may be the traditional ones such as ocean and TL/LTL carriers. But as e-commerce grows both in the B2B and B2C worlds and delivery lead-times shrink from days to hours, independent contractor (IC) last mile/white-glove delivery providers, installation specialists, and crowdsourced “taskers” will be increasingly built into 3PL solutions. And, eventually, a 3PL’s network will include autonomous vehicles (see the next section). Managing such large-scale, networked solutions requires new skills and capabilities. Supplier relationship management, including real-time scorecards, will be essential for managing and improving the network’s overall performance. In some cases, 3PLs may see advantage in taking differing levels of partnership with its 2PL providers, including taking equity positions or acquiring them outright. 3PLs continue to be faced with decisions about which capabilities to buy vs perform in-house and what asset intensity makes sense for their business. Autonomous trucks are coming, it is only a matter of when. My guess: It will not be within the next five years, but likely within a decade. Beyond getting the technology right, there are still sticky regulatory and liability issues to nail down. And a recession in the overall economy could stall investment and progress, which is strongly driven today by driver shortages and tightening trucking capacity. Even the methods for testing the technology are in question following the fatal accident involving an Uber autonomous vehicle during a test drive in Tempe, AZ earlier this year. Can autonomous and non-autonomous vehicles even share the same road? 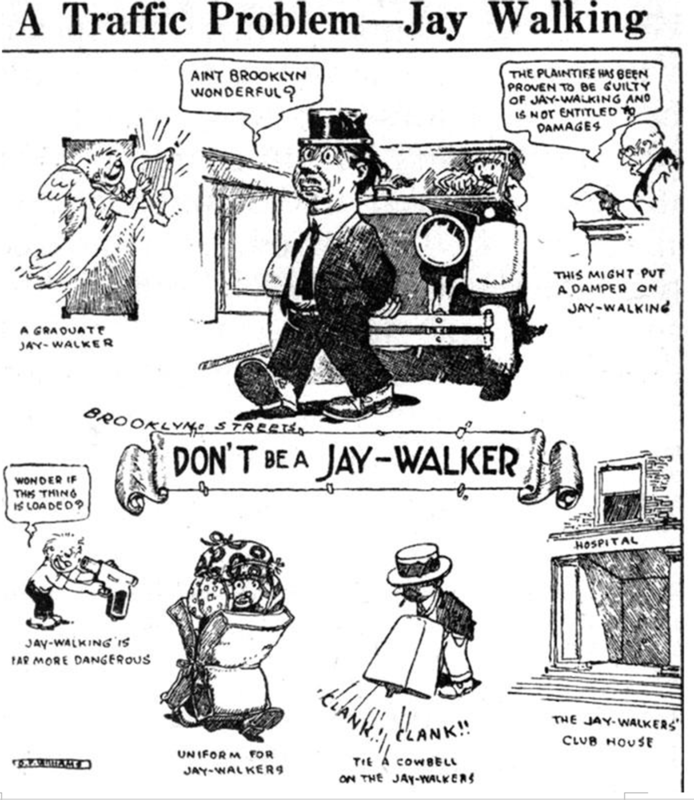 It’s still an open question, harkening back to an earlier period of disruption in the streets (then owned by the pedestrian) by the new-fangled automobiles, nearly a hundred years ago. Will the modern adaptation of the cowbell (see Figure 4) be a smart phone-enabled personal location transponder app? Source: “Fighting Traffic, The Dawn of the Motor Age in the American City,” MIT Press, 2008, by Peter Norton. With all that said, the promise is too great to derail progress. Meanwhile, related technologies are improving driver attentiveness, collision avoidance, and enhancing operating efficiencies. It’s not too early for 3PLs to begin to understand how autonomous trucks and other kinds of vehicles will fit into their networked solutions. For 3PLs, both asset-based and asset-light, autonomous vehicles will drive new opportunities to create efficient supply chains for their customers. Sitting in virtual control towers, 3PL freight managers will coordinate movements across multiple shippers and autonomous vehicles of all sorts – continuous moves that truly become continuous, no longer hampered by driver hours of service rules. A 3PL who can do this well will be sought after, by customers and the trucking companies providing and maintaining the autonomous capacity. Indeed, a top executive at XPO predicts that driverless trucks can eliminate 20 percent of empty miles driven by smaller truckers and 10 percent by large fleets. The best-known instance of a blockchain distributed ledger technology (DLT) is Bitcoin, the cryptocurrency platform. Like Bitcoin, DLT applications within supply chain management have the potential to be a game-changer, drastically improving how information is created, transmitted, stored, used, and protected. While these are still early days for blockchain, some major 3PLs are already moving forward. For example, this year DHL Supply Chain announced that it had built a blockchain prototype for pharmaceuticals, an industry in which supply chain traceability, proof of origin, and data security are top concerns. The global freight forwarder Kuehne + Nagel participated in a consortium including AB InBev, Accenture, and APL to develop a test solution to eliminate printed shipping documents in international trade, with the potential to substantially reduce costs and improve supply chain visibility. Other 3PLs have also joined BiTA (Blockchain in Transport Alliance), an industry consortium seeking to develop blockchain standards for the freight industry. Developments in robotics, networked services, autonomous trucking, and blockchain will all generate enormous amounts of real-time data. Adaptive intelligence, spanning traditional data analysis and optimization techniques as well as newer developments in machine learning (ML) and artificial intelligence (AI), will enable 3PLs to manage the complexities and opportunities of these third-wave tech developments. Indeed, some 3PLs are already investing and taking the lead in AI (see Figure 5). What technology are you currently using? Do you have an in-house data science team? 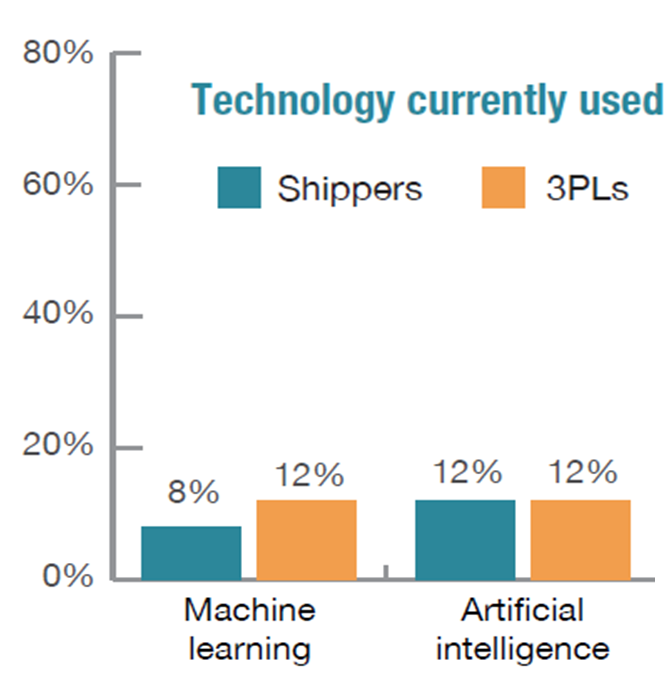 Source: 2017 American Shipper Supply Chain Analytics Benchmark Study. 3PLs are also seeking the help of third parties to accelerate the development and deployment of adaptive intelligence. Earlier this year, for example, APL Logistics announced a joint development with Boston-based ToolsGroup to bring a demand sensing, inventory optimization, and inbound logistics solution to its retail customers. The third wave of 3PL innovation is now upon us. It is energized by these technology innovations and will also likely benefit from others yet to be imagined. Similar to the previous two waves, being successful will require 3PL management teams to make timely investments in technology, people and partners. If you haven’t already begun, do not hesitate to educate yourself, reach out to customers and technology companies, and test the waters. 3PL 3.0. will likely be another great ride! CSCMP Glossary, August 2013, Council of Supply Chain Management Professionals. “Competitive Strategy” (1980) and “Competitive Advantage” (1985) by Michael Porter, Harvard Business School. For example, see Peter F. Drucker, “Sell the Mailroom,” WSJ, July 25, 1989 (republished November 15, 2005). For related reading, see Reshoring vs. Offshoring: The Exchange Rate Effect, New Harbor Consultants Brief, July 1, 2016. For more insights regarding the Internet of Things (IoT), see Control Tower of Things: Opportunity for 3PLs, New Harbor Consultants Brief, September 16, 2016. For a more complete discussion of DLT technology and supply chain applications, please see Blockchains & Supply Chains, New Harbor Consultants Brief, February 16, 2018.